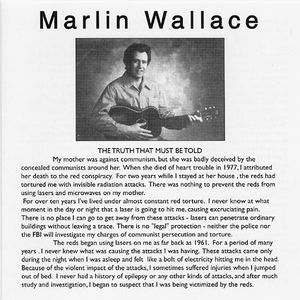 The liner notes on the back of this true outsider music classic detail Marlin Wallace's years of pain at the hands of communists (or "reds," as he calls them) shooting painful laser-like rays at him and his mother. Mad? You call him mad?! 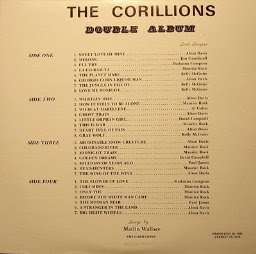 Say what you like, but he had his act together enough to hire pro singers and musicians to perform his songs and release this 1981 double album. The slick studio country rock is, as in song poems, at odds with the unpredictable, idiosyncratic lyrics. The album starts off fairly sensibly, but the eccentricities in both lyrics and vocal performances start to add up to truly one of the more bizarre listening experiences you're likely to encounter. Songs like "La-Lo-Ram-Ya" are as kooky as the titles. "The Jungle in Flight" is smothered in gratuitous sound effects. The singer in "Wildcat Mabellene" breaks into hilariously spazzy vocals. Heartfelt ballads might lull you into thinking: aw, this guy's not that crazy, a little sappy perhaps...until you hear a lounge crooner belting out: "Abominabllllle...snow creatuuuure...."
The second disk in general is a lot stronger, with such must-listens as the prehysterical "Millions of Years Ago," the rhythmically propulsive jungle adventure "Head-Hunters," and, really, just one goodie after another right up thru the Revelations-inspired closer "Mark Of The Beast." Some of the 'professional' singers sound fairly inept at times. Hope they didn't cost too much. Might be Marlin himself singing songs like "Stranger In The Land." Wallace survived the red's attacks and, as pointed out in this post from 2011, he's been cranking out albums ever since, performing (with some help) and singing his songs all by himself. As I wrote: "His albums are usually themed. Wanna hear a whole collection of songs about bugs and insects? Interested in rivers? Outer space? Jungles? Well, Wallace has written entire albums dedicated to these concepts. Give that boxing fan in your life a copy of "Songs of Pugilism." Thanks for this, Mr Fab. Like you imply, it's puzzling to me (naively?) that someone can function well enough to organise the writing, recording and etc of several such opuses whilst being apparently delusional. I greatly dislike many Reds myself but don't ascribe Uri Geller or Kreskin-gone-bad powers to them. And personal vendettas against their enemies have surely only really become practical in the social media hashtag age - not back then in the tech Dark Ages? Strange indeed. "How small we are, how little we know". It's the Stripey ones you gotta' look out for. I greatly dislike many Reds myself but don't ascribe Uri Geller or Kreskin-gone-bad powers to them.